First we thought it was an April Fools Day scam, then it became reality, then it fell apart, but now it is official. Toronto FC has traded star midfielder Dwayne De Rosario to the New York Red Bulls in exchange for defensive midfielder Toni Tchani and midfielder Danliegh Borman, along with a first round draft pick in the 2012 MLS SuperDraft. Wowzers. We heard about the rumor all afternoon and thought it died off as quickly as it came out. But things have a funny way of working out don’t they? 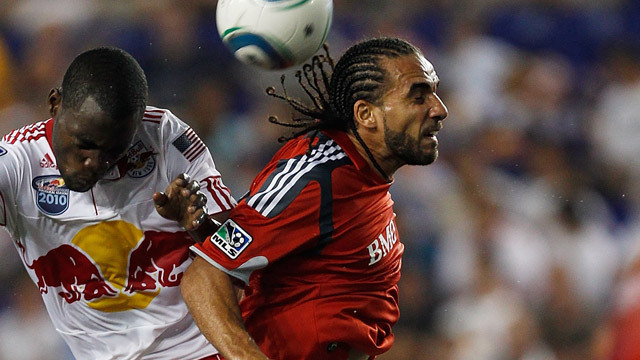 DeRo gets out of Toronto, a place he apparently has a love-hate relationship with. He goes to a star-studded New York squad that continues to get deeper by the minute. Holy cow, I just had a thought of their lineup with him in it. Think of it for a moment. They have guys like Rafa Marquez and Tim Ream in the back, the midfield with DeRo in it now along with Joel Lindpere and Dane Richards, with Thierry Henry and Juan Agudelo up top. Absolutely sick. New York is a contender for right now, there is real no other way of putting it. If they don’t win it all this year, something will be terribly wrong because this addition really should set them a level above the majority of clubs in the league. Though saying that I still see Real Salt Lake and the LA Galaxy giving them fits on any given day. On the Toronto side of things I think they made out pretty well with this deal. While I could care less about the Borman side of things (that was probably more a money part of the deal than anything else), I do like the addition of Tchani for them in their midfield. They must see that Julian de Guzman isn’t working out well for them and Tchani can compete for a starting spot right away. Plus adding a draft pick next year, even though it will possibly be a very late one, is always a nice thing to get in any deal.